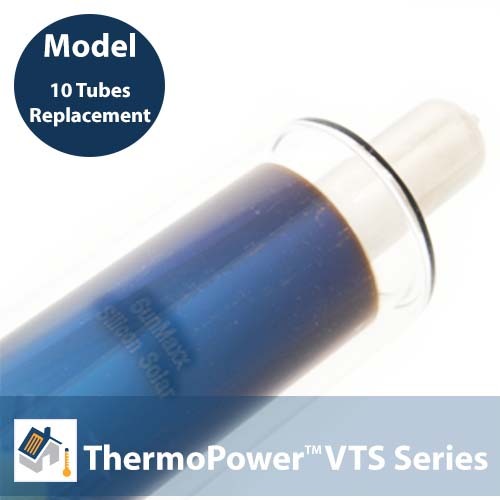 SKU: ThermoPower-RP-VTS-TUBE-10. Category: Replacement Evacuated Tubes. Replacement tubes for SunMaxx evacuated tube collectors. All ThermoPower-VTS series evacuated tube collectors with 2,000mm x 58mm evacuated tubes. Its important to check the sizes, as some VTS tubes are 58mm x 1800mm. Can I purchase only one evacuated tube? No, as the evacuated tubes must be safely packaged in boxes of 10pcs. Can I ship via UPS/Fedex? No, all tubes must be shipped by LTL, pickup or SunMaxx direct delivery services. Can I use non-SunMaxx evacuated tubes as replacement tubes? No, this will void the warranty of the equipment.